Show Margin -- Check to show the margin. Folding -- Check to enable folding. 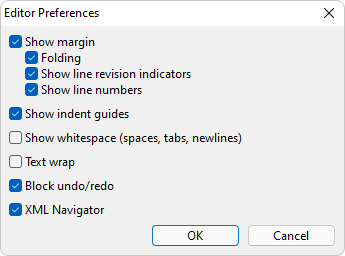 Show line revision indicators -- See Navigating your XML Document. Show line numbers -- Check to show line numbers in the margin. Show block indicator -- See Navigating your XML Document. Text wrap -- Check to wrap text. Block undo/redo -- Check if you want to group your text operations in a single Undo/Redo operation.